More than 30 youth leaders, youth health experts and activists attended a meeting organised by the Youth Commission on youth health, HIV and Aids and substance abuse in Pretoria recently. They represented national youth organisations and youth health non-government organisations. Youth Commission Chairperson, Nomi Nkondlo, said our youth should be at the forefront of developing and putting into place policies and plans on the issues of health and HIV and Aids. Following this meeting, Deputy President Phumzile Mlambo-Ngcuka, opened the first meeting of the Youth Health Working Group at the Union Buildings. The purpose was to talk about the South African National Aids Council's National Aids Strategic Plan. Topics included how to meet targets to reduce the spread of HIV and Aids. 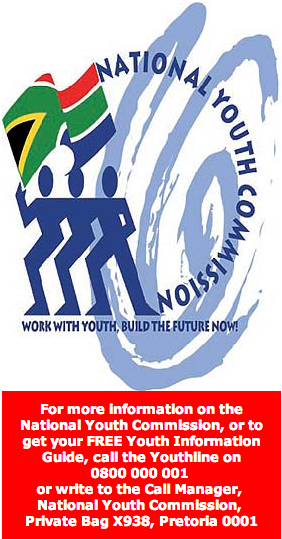 The Youth Commission was asked to manage the youth's contribution to the new Aids Strategic Plan. A gathering of different youth organisations will take place later in the year to talk about contributions to the Plan.